Review and photographs by Hubert Hung. One of the first modern board games that I played was King of Tokyo. It is a custom dice chucking game centred around a Yahtzee mechanic (you roll a set of five dice three times trying to complete certain sequences often based around poker hands). Each player takes control of a monster that is fighting for supremacy over the city Tokyo. I was not bowled over after my first game, but it was fun. Unless you buy an expansion it really did not matter which monster you picked. It did not give you any special powers or stats. For that reason it felt a little flat for me. Then I came across Dice Throne. It uses the same dice rolling mechanisms, but this time each of the six fantasy characters are different. You start off with the same health and resources, but you have different abilities and cards in your deck. This makes each one play differently and I love variable player powers. It has custom dice too. This game ticked a number of my boxes from the off! Dice Throne’s dice, player health and Combat point dials, trays, cards and tokens. The aim of Dice Throne is to battle your opponent until one of you is left standing by reducing your opponent’s health to zero. There are various ways you can play the game, head-to-head is by far the best. You can have three duels going on at the same time if you want. The game gives you various multi-player options including teams, but you can make up your own way of doing it. You can lengthen the duration of each fight by modifying the health level at the beginning. The six player free for all should be avoided as there is too much down time between rounds. Plus there is no way to stop one player being picked on. I introduced a token system so players can be attacked once in a cycle. I like the idea of three duels occurring simultaneously. This is my own idea, the victors from each then battle each other by attacking only the person in their left until one remains. The losers do the same. Each character’s health is reset and opponent tokens removed. The cards, the boards and Combat Points (CP) are not. There is no reason why a game could be conducted like this. 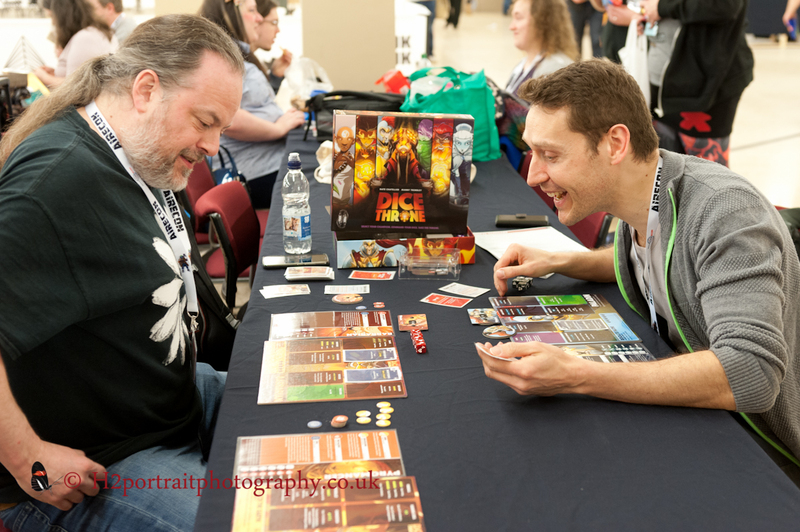 The game lends itself to players coming up with their own way of running a tournament. The six removable trays in the box. There is a handy turn card for each player that explains the order of play. After a few rounds you soon pick it up. Each turn there are maintenance and roll phases. After your roll you look at player board and the results to work out what you can do. You have three rolls in total and you keep or re-roll any of the dice that you want. After the third roll you cannot make any more changes. You can stop earlier if you roll something you wish to use. If applicable, you deal the appropriate damage to your opponent. They make a defensive roll in an attempt to avoid some of the damage or inflict some back to you. You can play certain cards at specific times during the turn as long as you have enough CP. 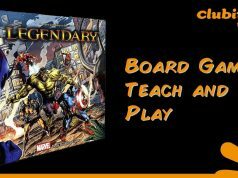 Some will upgrade your player board, others will give you resources and even abilities like manipulating your dice roll. Players also have tokens that can cause trouble to other or help themselves. The turns play quickly and pass back and forth until one person has zero health and loses. Pretty much everything about this game is quality. The custom dice are engraved and of a decent weight. 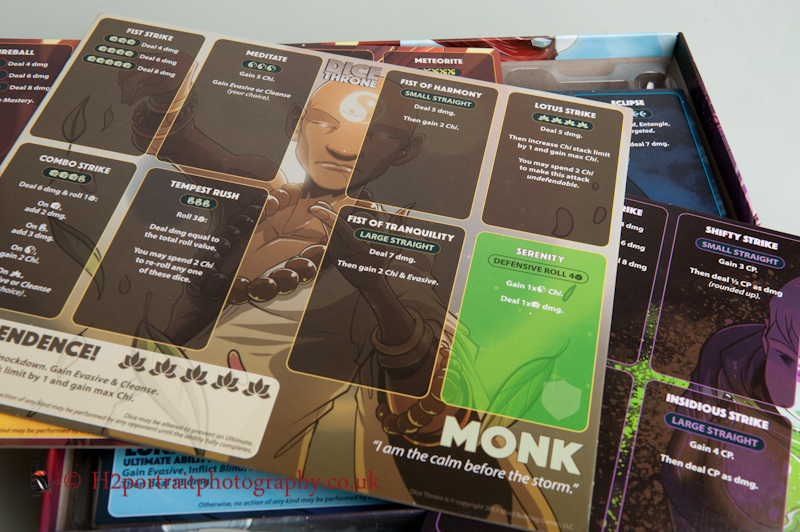 The player boards are made from a thick cardboard and the character’s special powers are made from a thin card. The tokens are decent. The cards are fine too. The dials are gorgeous so much better than using tokens on a track that might be nudged out of place. The trays are well moulded and lift out of the box. 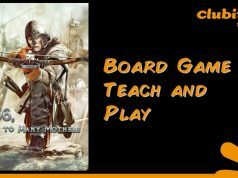 Once a player has chosen their character all you have to do is give them the tray, board and powers sheet. Then set the dials to appropriate amounts, place the relevant tokens (that sit at bottom of the tray, I put them in small component bags), shuffle and draw four cards and off you go. 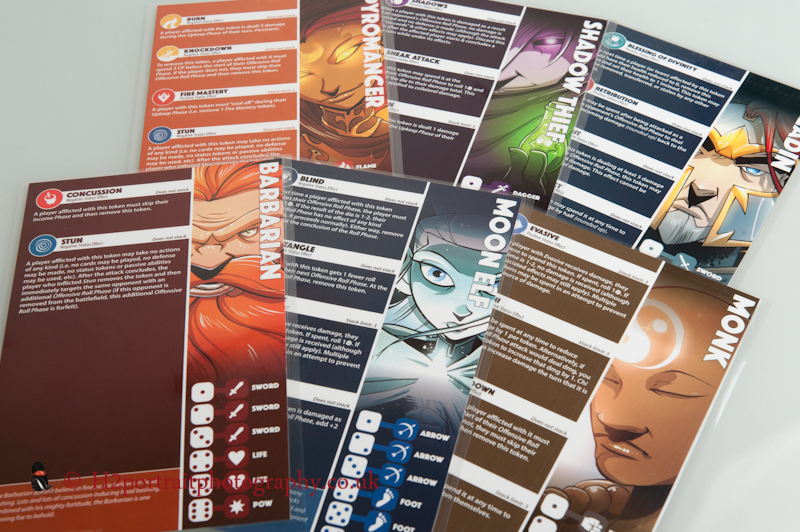 The player boards are well laid out and the powers sheet has what is on each face of the dice. The art is fabulous and the colours rich throughout. Even the dials have the characters on them. The cards do lack any major illustrations and some have expressed displeasure at this, but I think it is fine. It can make them too busy or obscure the text. There is accompanying iconography and colour on the cards that let you know when to play them and, if applicable, where. There is a large rulebook with everything laid out well and illustrated. It even grades how complex each character is to play. I am very happy with it. 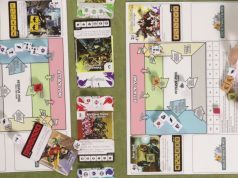 The six combats in Dice Throne and their power sheets. NB. They do not come laminated. There is nothing new about the mechanisms or mind blowing. The game does flow well and does not need anything complicated. They work well enough. This game is easy to teach, I taught it to a friend whose first language is not English. Because of this pretty much anyone can play it. You can play some of the easier characters first, but the complex ones are not that hard to learn. The character’s power sheet explains everything you need to know and well. The game is fun too and therefore you will want to play it time and again with different people. With six characters you have plenty of options and, at the time of writing this review, another six are being developed through a crowd funding campaign. Then there are team options at higher player counts or a free for all. 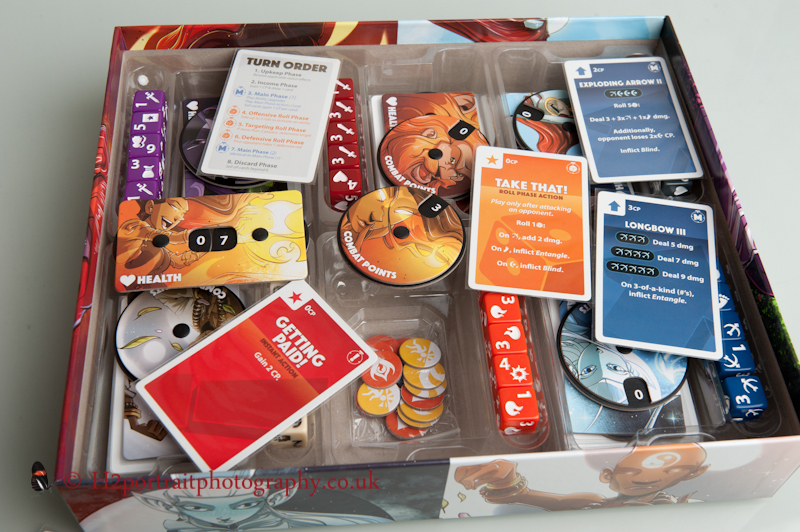 This game costs much more than King of Tokyo, but there is so much more in the box. For variable player powers you need to buy an expansion. This comes as standard in this game and six characters! There are deluxe dice out there with a marble finish, but the ones in the box are impressive. Each character has their own custom set of five. As this game has a high replayability the cost per play will be low even if the initial cost is twice as much as that of King of Tokyo. There is a background story, but once you start playing it is pretty irrelevant. You are just out there to crush your opponents. What is important is how each character feels when you are playing them and then the theme bursts through! The Moon Elf dodges opponent’s attacks to reduce their damage whilst blinding you with exploding arrows. The Pyromancer can set an opponent on fire so she inflicts damage each round. They all have different play styles and you need to utilise them to win. This game is just loads of fun. It is light and pretty simple yet oozing enjoyment (at least for me). 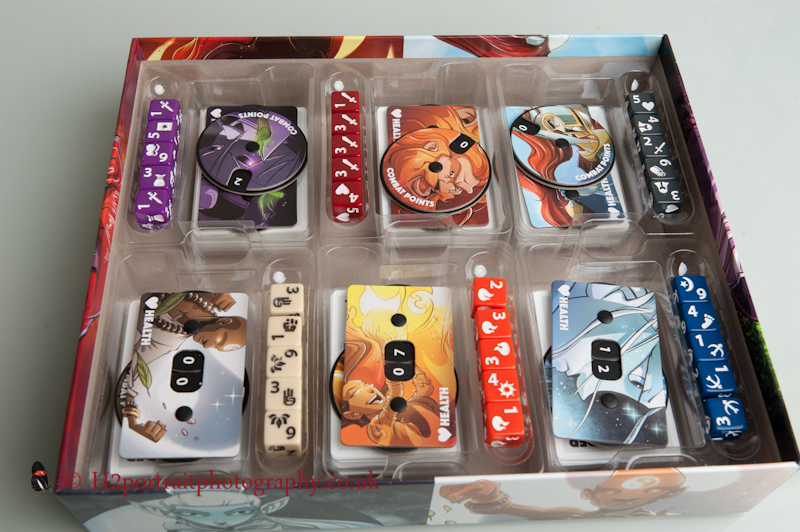 I like player verse player games of this type and it scratches where King of Tokyo did not. It is fun watching your opponent squirm as you dish out the damage or negate their attack, but it works both ways. The mechanisms are slick and you never feel bogged down or having analysis paralysis attacks. You may need to think hard about which dice to re-roll. In some games it has gone down to the wire with neither player having the upper hand. In one game that I played, I was ahead through most of it and then lost as my opponent pulled off huge attack leaving me with a crushing defeat! Good for them! If you want tons of strategy or thinking turns ahead this is not for you. If you like chucking dice and pummelling your opponents into the dust, this game is perfect. Dice games have a high element of luck to them, but the cards can mitigate some of that. I am so glad I bought this game. It will be well played in my gaming circles. 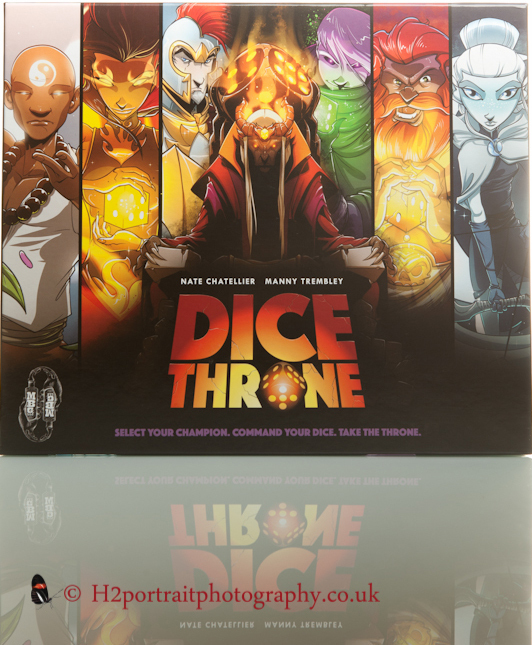 If you have played Dice Throne please let us know what you thought of the game or if dis/agree with this review? If you would like to know more please also comment and we will try to answer your question.